Todd Moore had just returned home to Albuquerque from a book-signing and reading tour of southern California, and he was still unwinding from the road. 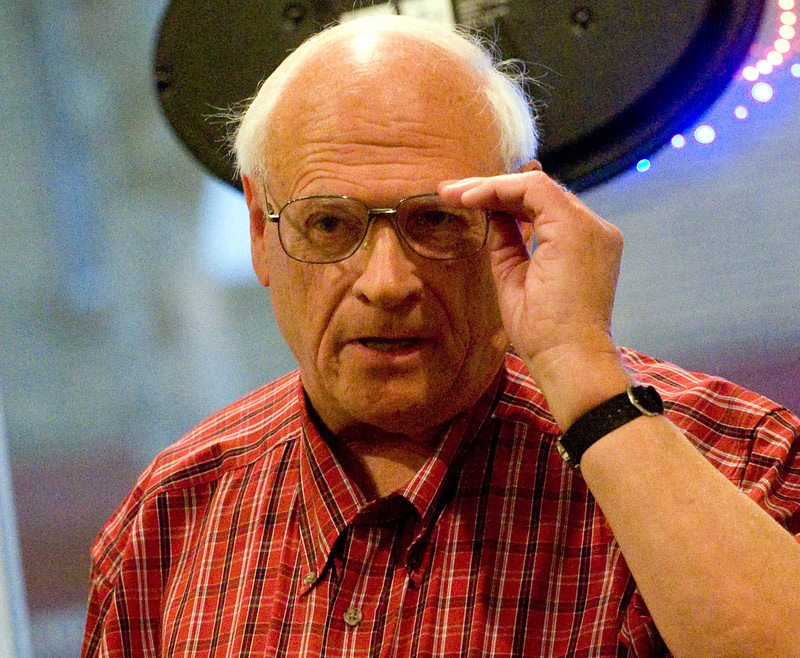 At age 71, he confides, such travels can be exhilarating but strenuous. He was glad to be relaxing on a warm July afternoon in the way he enjoys most, with free-ranging conversation laced with anecdotal recollections and tactful name-checks. “It was pretty surprising, what you might call a sign,” says Moore, chatting over a Reuben sandwich with fried pickles in O’Niell’s Pub. “I was at the Flying Star on Juan Tabo about a year ago, enjoying the view of the Sandias and trying to get my writing started for the day, but I was sort of blocked, not sure where to begin. 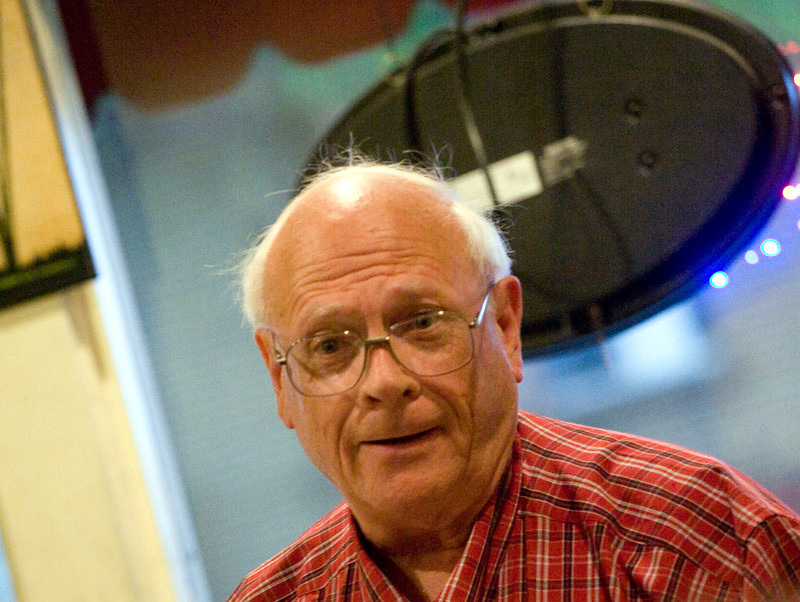 The famously reclusive New Mexico novelist could well have been lunching at Flying Star, perhaps signing movie contract papers for the forthcoming film version of his best seller “The Road,’ Moore and I agreed. Whether speculative tall tale, or factual report, this famous-author-sighting-and-inspirational-anecdote makes for a good story. That’s how Todd Moore sees the world– as myth and legend–and that’s how he describes it in his concisely worded but often epic-length poem-cycles. And it is no accident that Moore’s favorite living writer is Cormac McCarthy, a novelist famed for his cinematic style, careful use of language, painstaking historical research and violent subject matter. That also would be a fitting description of Todd Moore’s own literary output. 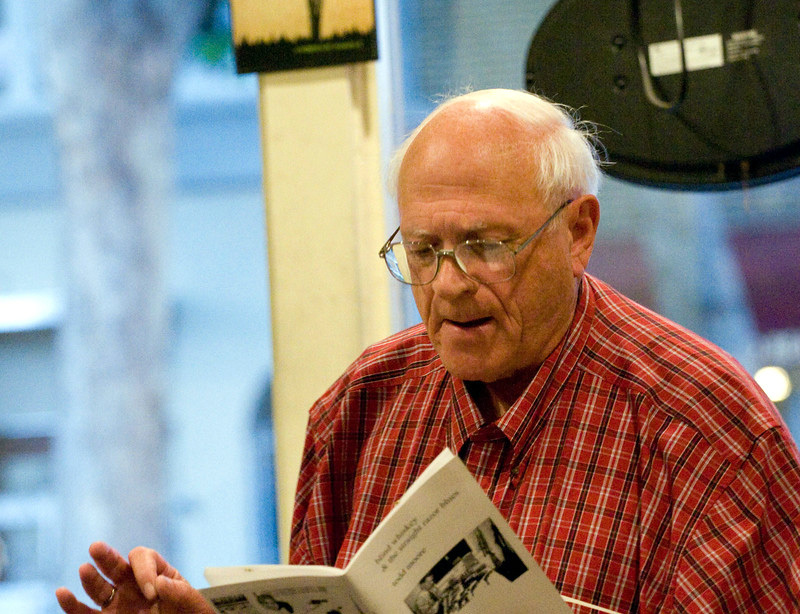 Though he’s a retired school teacher, Moore’s literary persona is neither socially conformist nor pedantic. 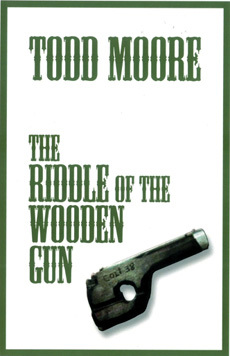 It could be described as decidedly edgy, in Moore’s own words, “outlaw”; the language choices are often salty enough to fit a gunslinger or an old tar. Both write in cinematic styles, and both carry on the time-honored American outlaw myth tradition associated with classic tough-guy filmmakers like John Ford, Sam Peckinpah, and with all of those Humphrey Bogart noir classics. Todd Moore’s biography and family history, as told to me that day and detailed in his many published interviews and on his own Saint Vitus Press Web site and blog, contains not a small dose of myth-worthy facts and tempting speculations. Moore’s own childhood, in urban Illinois settings near Chicago, was lived in dangerous circumstances. 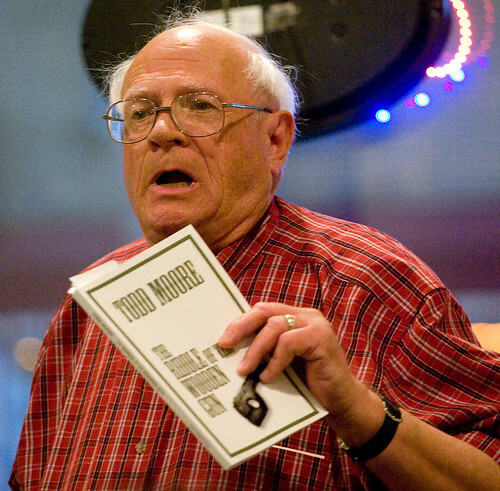 Though Moore’s dad may not have recorded his own stories, Moore, who went to college on a teacher’s scholarship and began writing early, carries on the family story tradition, lacing his recollections with detailed digressions about the notorious figures of Depression- era Midwest America. “Capone invented the soup kitchen before the government did anything, and he kept right on feeding people into the Depression years,” he said. It is that romantic take on the admittedly larcenous and often murderous criminal celebrities of bygone days that gives Moore’s narrative poems and personal outlook their sentimental flavor, for all his admiration of hardboiled writers like Ernest Hemingway and Raymond Chandler. 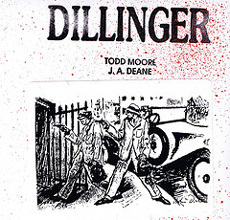 Early ‘30s bank robber John Dillinger, the subject of several of Todd Moore’s books of verse, including “Dillinger” and “The Riddle of the Wooden Gun,” had a soft heart for the working poor and women and a reluctance to kill anyone, even police, at least according to Moore. “It’s only documented that he personally killed one person, a cop who was firing at him, and even that was clearly self-defense. Dillinger felt sorry about the killing afterwards, and said so,” according to Moore. This conscientious, affectionate yet machine-gun toting legendary John Dillinger is very much like the one portrayed by Johnny Depp in the recently released movie “Public Enemies.” Depp’s Dillinger refuses to steal the pocket money of bank clerks, only raiding the vaults, and he shoots but a withering glance at one of the FBI agents firing lethal bullets at him outside Chicago’s Biograph movie house. Moore is unreserved in his praise of the film; he’s already seen it three times and plans to go again soon. Moore notes that the almost subliminally planted references to both Italian Fascist dictator Benito Mussolini and to Ethiopian anti-Italian resistance leader Emperor Haile Selassie I add to the film’s historical context and make it really fun to watch. My lunch interview with Todd Moore stretched out into an all-afternoon yarn-spin and wide-ranging literary chat. Moore had much to say on one of his favored topics: the quality dampening conformity of academia and its grant-favored or tenured poets. 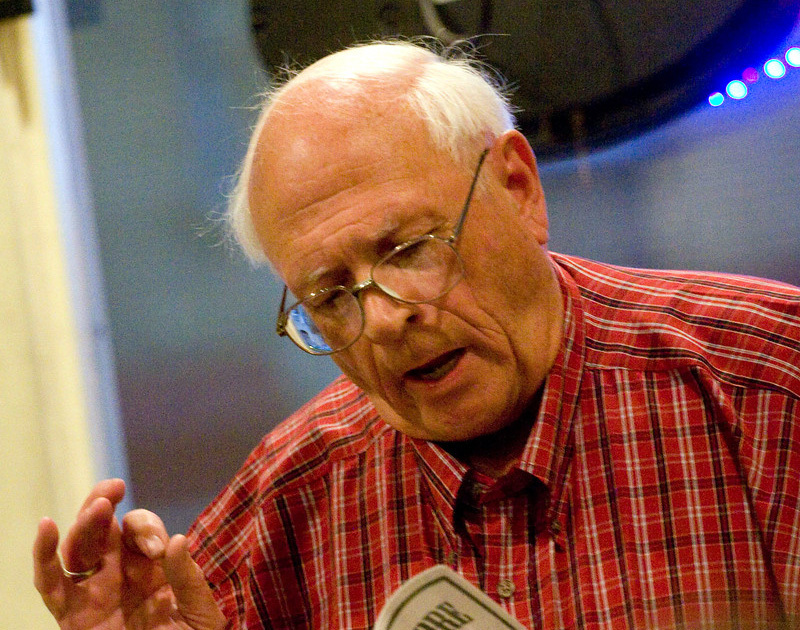 And he eloquently outlined his own concept of the counter-academic literary alternative offered by self-styled “outlaw poets” such as himself, Santa Fe’s poet/songwriter Kell Robertson and, according to Moore, even the “poetic outlaw” novelist Cormac McCarthy, a famously anti-academic author himself. The afternoon sped by very fast, and we had to part to be home in time for dinner. I would love to report every tale told and every opinion offered by Todd Moore, but I think leaving my readers to go to Moore’s poems and, perhaps, to attend one of his fabled readings, is a better plan. For more information, visit www.saintvituspress.com or www.lummoxpress.com –Bill Nevins is a contributing editor to albuquerqueARTS. Editor Note: All Todd Moore images by Roy Manzanares. Todd Moore will be an honored reader and panel discussion leader on the topic Poetry & Movies at the First Annual WORD! Poets & Songwriters Movie Festival, Albuquerque NM November 7-11, 2009. For details, visit http://www.guildcinema.com in coming weeks.